38ft Slip and Slide ride. Starting Rental Price of $259/day. All of our rates are by the day, we deliver in the morning and pick up at night. We ask for a 20% deposit with the remaining balance due on delivery. 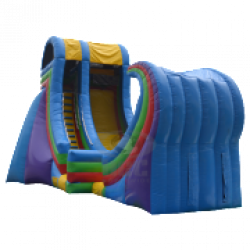 This colorful dry slide is a real crowd pleaser. Towering at 24' tall and featuring dual sliding lanes. A must have to any festival and can be accompanied with any of our large selection of interactive games to keep everyone entertained for hours. $479 for the day. 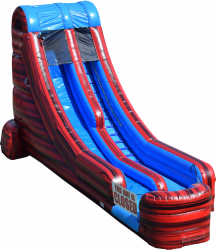 20ft Dry Super Slide. Starting Rental Price of $299/day. All of our rates are by the day, we deliver in the morning and pick up at night. We ask for a 20% deposit with the remaining balance due on delivery. 22ft Waterslide with Slip and Slide attachment. Starting Rental Price of $479/day. All of our rates are by the day, we deliver in the morning and pick up at night. We ask for a 20% deposit with the remaining balance due on delivery. The RipCurl is a waterslide and slip and slide in one. 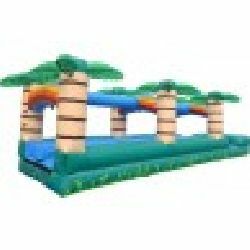 This wave theme slide features and extended slip and slide landing area for twice the fun. Rental rates start at $329/day. Rock Rush Wet/Dry Slide. 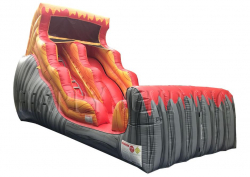 Starting Rental Price of $249/day for a dry slide. Water option adds $30. All of our rates are by the day, we deliver in the morning and pick up at night. We ask for a 20% deposit with the remaining balance due on delivery. Please remember to choose waterslide option if you are using it wet! Red Rush Wet/Dry Slide. 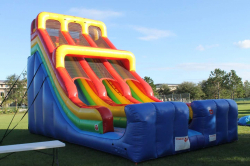 Starting Rental Price of $249/day for a dry slide. Water option adds $30. All of our rates are by the day, we deliver in the morning and pick up at night. We ask for a 20% deposit with the remaining balance due on delivery. Please remember to choose waterslide option if you are using it wet! 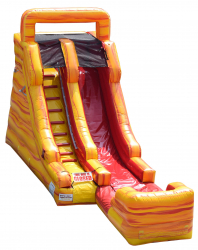 This molten colored double drop wet and dry water slide can be used year-round. Starting Rental Price of $269/day. Waterslide option adds $30. All of our rates are by the day, we deliver in the morning and pick up at night. We ask for a 20% deposit with the remaining balance due on delivery. 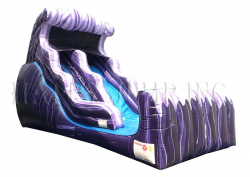 This purple colored double drop wet and dry water slide can be used year-round. Starting Rental Price of $269/day. Waterslide option adds $30. All of our rates are by the day, we deliver in the morning and pick up at night. We ask for a 20% deposit with the remaining balance due on delivery. 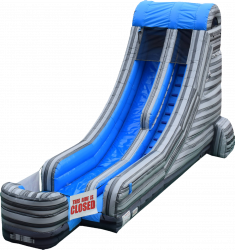 15ft Wet/Dry Slide Starting Rental Price of $199/day for a dry slide. Wet option adds $30. All of our rates are by the day, we deliver in the morning and pick up at night. We ask for a 20% deposit with the remaining balance due on delivery.